This light and fluffy Easy White Chocolate Tart recipe is perfect ending to any holiday gathering! It’s the holiday season and that means parties galore. I love to serve a sweet treat at the end of a meal but don’t want something heavy and dense, especially when everyone’s calendar is full of special events. 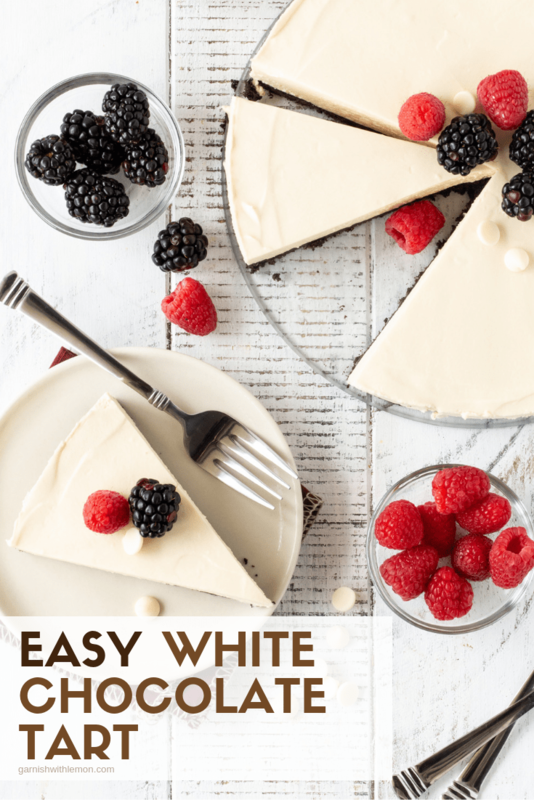 This light and fluffy make-ahead Easy White Chocolate Tart satisfies any sweet tooth and makes any gathering more memorable. Is it hard to make a tart? Pies scare me. It’s easy peasy! The difference between a pie and a tart is the pastry. This tart uses a cookie crust on the bottom and is just the filling on top. The recipe is just a handful of ingredients, and is so easy anyone can make it. Do I need to bake the cookie crust? Nope, not for this recipe. Give it 15 minutes in the freezer to set the crust and you are good to go. This is truly a no-bake dessert from start to finish. What makes this tart light and fluffy? Tarts are super easy to make, but there is a secret to making it smooth and fluffy. The key? Make sure your cream cheese is at room temperature before you mix it with the powdered sugar. It is amazing the difference that it makes. Cold cream cheese = lumpy tart. Trust me. 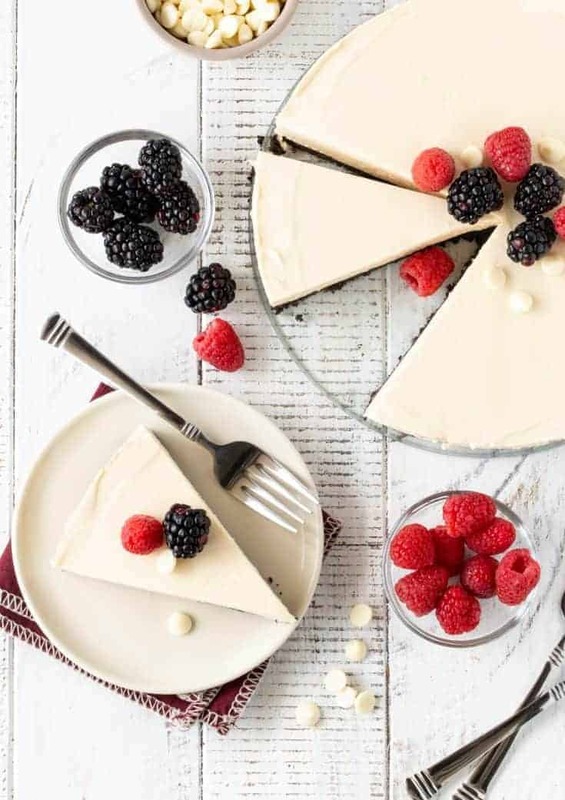 Can I make this White Chocolate tart ahead of time? Absolutely! Make it a day ahead of time and store it in the refrigerator. If you are a planner and working ahead of time, you can even pop it in the freezer and it pull it out shortly before serving. Garnish it with fresh fruit for a stunning presentation. What makes this Easy White Chocolate Tart taste so good? 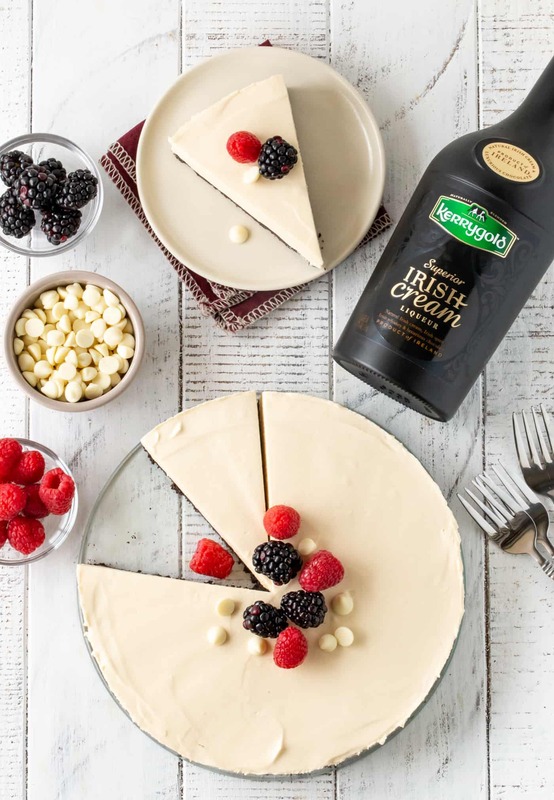 That’s our secret ingredient: Kerrygold® Irish Cream Liqueur. It’s just a small amount, but the rich taste is second to none. The Irish Cream flavor pairs perfectly with the white chocolate and the chocolate cookie crust making this tart a decadent treat. 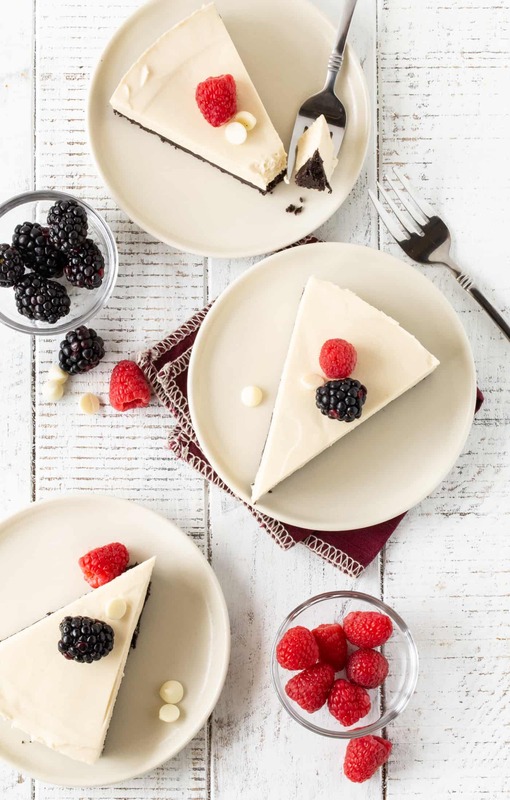 Winter, spring, summer or fall, this Easy White Chocolate Tart is a scrumptious way to end any gathering. Once you try it, you will wonder what took you so long to make it. This foolproof dessert will quickly become a go-to for easy entertaining. This make-ahead dessert always disappears! Add chocolate cookie crumbs and melted butter to a small bowl and stir to combine. Pour crumb mixture into 8- inch spring form pan and press firmly with fingers to make crust. 3. In another medium bowl, add the whipping cream and whip until soft peaks form. Fold into cream cheese mixture and stir until combined.